It’s important to size an electric motor properly. Doing so will produce a pumping unit that is more efficient and provides a longer service life. Failing to size the motor correctly will result in a pumping unit that demands more power than it should or one that produces repeated electric faults and may suffer from premature motor failure. Electric motors are generally sized at predetermined intervals. What this means is that in most cases you will need to round up to the next available motor size when determining how large a motor to couple up to a pump. So if the pump power requirements indicate that the motor should be rated for at least 4.5 HP, you’ll have to round up to the next normal motor rating: 5 HP. While you don’t want to undersize and electric motor, the vast majority of motors are designed with a 1.15 service factor which will provide a bit of an insurance policy. What this means is that a motor rated for 100 HP is actually capable of continuous operation at up to 115 HP (100 x 1.15). However, if the motor is operated on a variable frequency drive additional heat will be generated and the service factor will no longer come into play. What are the power demands of the pump? What will typical operation look like for this pump? Will the pump be operated on a variable frequency drive (VFD)? What is the power demand at the rated design condition? What is the maximum power required to operate the pump at any point on the pump performance curve? The power required to drive the pump at the rated design condition should always be less than the nameplate horsepower rating of the motor. 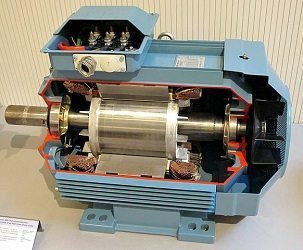 So if the pump will require 4.5 HP at the design condition, at a minimum, the motor should be sized for 5 HP – the next nominal size above 4.5 HP. In many cases, it will make sense to select a motor large enough to handle the maximum power demanded by the pump at any point along the curve. This maximum power value is referred to as the non-overloading brake horsepower of the pump, or NOL BHP. Sizing a motor to handle this power demand will ensure that the motor will be able to operate the pump even if the operating conditions change dramatically. Some pumps are installed into systems where it is known that the pump will operate at the rated design condition 100% of the time. However, most systems will require that the pump operates across a wide range of conditions. For those cases where the pump will operate continuously at a single condition, sizing the motor for the power demands at that condition is acceptable. In other cases, where a range of operating heads will be encountered, it is best to size the motor to handle the NOL BHP of the pump. Will the Pump be Operated by a Variable Frequency Drive? If a pump will be operated on a VFD, then the motor should be sized for the pump NOL BHP, and the motor nameplate HP should be more than the pump NOL BHP without any consideration given to the motor service factor. Remember, the motor service factor disappears when the motor is operated by a VFD. The only exception to this is a case where the pump will operate at a single condition 100% of the time. If the pump will not be operated on a VFD, then sizing the motor becomes a matter of choice. Best practice dictates that in all cases the motor nameplate HP rating should exceed the power demanded by the pump at the design condition, and many customers also want the NOL BHP to be less than the motor nameplate HP. In other cases, the motor nameplate HP rating will be selected to exceed the power demanded by the pump at the design condition, but will be less than the NOL BHP. This is ok as long as the customer understands how the motor was selected, and as long as NOL BHP is less than the nameplate HP rating of the motor plus the service factor. Selecting the right motor rating is an important step in ensuring that the entire pumping unit provides reliable and efficient performance for years to come. Understanding and following the basic guidelines listed above will help ensure the right motor rating is selected every time.